It’s that time of year again. Every year, I say it’s not going to happen and every year it does. I am sick to death of summer and can’t wait for school to start again. Apologies to my teacher friends, but I’m hanging by a thread here until you go back to work. It’s not hard to find summer activities, frankly. I found lists of 33, 50, even 101 summer activities. Assuming you’re more frantic for an engaging activity than reading 101 allows, I’ve put together the ones I’ve found helpful throughout the years. The activity must be inexpensive; free is even better. The activity must involve a minimum of mommy/daddy effort in set up, tear down, and clean up. The activity must be one the child can do him or herself. Water painting. Give your toddler a brush, a bowl of water, and a surface to “paint.” Driveways, decks, sidewalks—anything is fair game. While painting my kitchen, I gave my three-year-old son his own brush and (yet unpainted) wall. He contentedly painted along while I actually got something done. Be sure to lay down towels if you’re painting indoors. Water tables. Sure, you could buy an expensive official water table, but an underbed box filled with a couple of inches of water and a few bathtub toys is just as much fun. Bonus? You could fill the box with sand instead and a plastic box is much easier to store than a blow-up pool. The sprinkler. I always forget about the sprinkler. 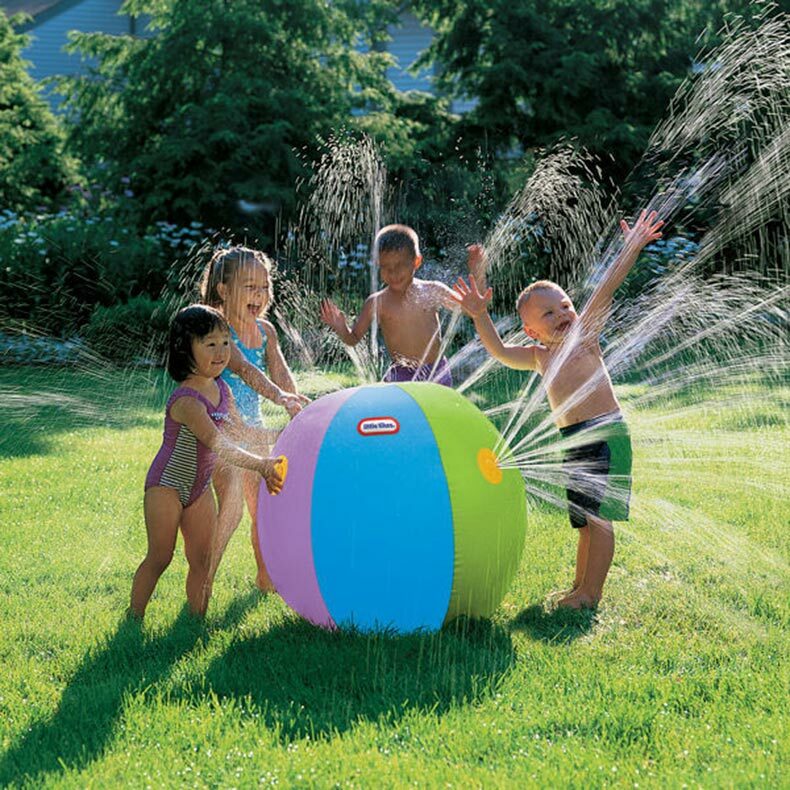 Set it up, turn it on and read a book while the kids get wet. They make fancy ones for kids, but mine were happy with that one on a stake that makes the pft-pft-pft sounds. Chalk drawing. One big box of sidewalk chalk kept our entire neighborhood tribe busy for hours last week, drawing dinosaurs from one end of the block to another. On her own, my daughter has written messages to me on the driveway. Live in an apartment? Maybe the owners will let you decorate the surrounding sidewalk. Eruptions. Mentos and Coke, anyone? Ala Mythbusters, we’ve ruined many a bottle of Diet Coke dropping Mentos down the neck and waiting for the chemical reaction that spews foaming Coke all over the street. Regular Coke may work better, but the Diet doesn’t leave sticky residue if you do this one on a driveway or sidewalk. I’ll admit to being too fond of erupting anything to miss out on this one. 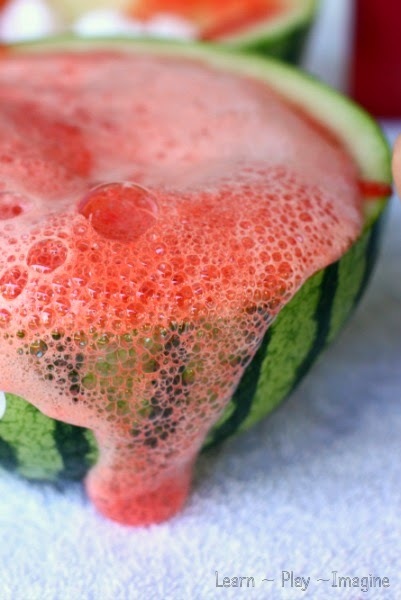 You can find a recipe for erupting watermelon here. Destruction. Buy an old dead receiver at the Goodwill, give it to your child and let them take it apart. You may have to open the case, but taking things apart was always just as engrossing as building them for my son. Cardboard. Get a really big cardboard box. Give it to the kids. Stand back. It’s a fort, it’s a school, it’s a house, it’s a godsend when you’re on your last nerve. Got toddlers? Tape a paper towel tube (use painter’s tape) to the wall at toddler shoulder height. 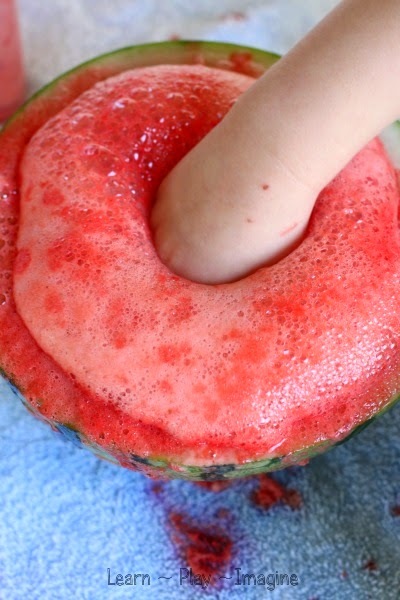 Put a container under the tube and let your munchkin enjoy dropping things down the tube. Cooking. Ok, maybe a lot of parent supervision needed. Tweens can generally handle this themselves (rolling out and cutting sugar cookies is a fav here), but don’t let little ones keep you from the kitchen. Even toddlers can dump sugar, flour, and vanilla into a bowl, after you’ve measured it out. With a plastic knife, they can cut up bananas and strawberries to make a Pretend Soup. Make sure to teach clean up, too. Make a movie. Yesterday, using their smart phones, my daughter and friends made a movie about the worst hospital in the world, pretending a doctor used a rusty saw to amputate a leg. Granted, this one requires a camera of some sort, but if you already have one put it to use. Younger kids can handle this one, too. My son spent a rainy afternoon making time-lapse clips of a Coke can exploring our house. Tell us how you are keeping your sanity through the long summer break. If you’re not in the US, help out your American friends. What do you do to keep the kids busy during school breaks? I would like to thank every publisher, mommy blogger, daddy blogger, etc. for all of the ideas included in this post. I’ve tried to link to those specifically mentioned. Love these ideas!! How come nobody told me about water painting when my kids were smaller. That is brilliant! Thanks! I was desperate and my son, who has ADHD, wanted to help. I don’t know if someone told me this, or it’s my own brilliance, but when the kids are crazy, water to the rescue!